It's been half a decade since the last universally-accepted "vintage" RIAT, but with the show's central theme of the United States Air Force's 70th anniversary drawing US participation back in numbers we haven't seen post sequestration, positive rumblings from the east, plenty of heavies pencilled for the static park, and a special BBMF 60th birthday celebration display; on paper RIAT 2017 set itself up to be a truly memorable Air Tattoo. Tom Jones reports from a cloudy RAF Fairford for UK Airshow Review. Photography by the UKAR Staff Team. 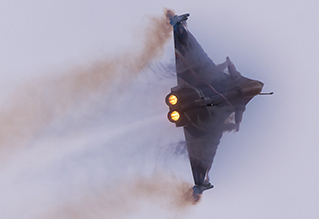 In a manner, RIAT can be described as so much more than a simple three, or even six day event. 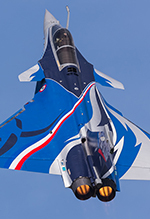 RIAT, like no other show in the world, can almost be considered a six month affair. From the moment the staff at Douglas Bader House announce their list of invited countries at the start of the year, discussion is rampant, and with its ebbs and flows does not truly cease until long after the last aircraft has flown home. 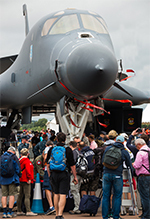 To many enthusiasts, the build-up to any RIAT has always been a deeply exciting affair and is as much a part of RIAT as the show weekend itself. When the "traffic light" system and Latest Updates pages were introduced in 2012 they were universally praised, as indeed they still are. However, there's a feeling that the willingness to provide information in the Latest Updates section has waned in recent years. For most of the 2017 build-up, the Latest Updates box was simply used to list what was added and cancelled that week. When introduced, it was of a much greater substance; offering glimpses on the extent of negotiations, which nations hoped to attend, the aircraft they hoped to bring, how far things had come, and in the event of cancellations, reasons for the cancellations and any encouraging noises about attendance at future shows. Just take a look at the same section in 2012 compared to this year. The depth of information then was a great way for us to see a glimpse of the goings on behind closed doors, and dare I say it, put an end to some of the more ludicrous speculation and rumours circulating online. It would be nice to see the updates section of the RIAT website give more information in 2018, as it used to do when it was first implemented. On a similar issue, there's been a great increase in the number of unscheduled "surprise" updates this year outside of the bog-standard Thursday 12.00pm refreshathon. As much as anything else, it speaks volumes of the quality (and to a certain extent quantity) of aircraft secured that the folk at Douglas Bader House can do it with such frequency in addition to the regularly scheduled lunchtime updates. The sporadic and unscheduled updates were great; the social media storm, the hastily-typed messages between friends, websites like UKAR and others frantically searching for an image of an aircraft to Tweet or put on Facebook and keep up with the news, and the excessive usage of smilies on the forum as members reacted added to the buzz of excitement ahead of the event. These surprise updates slowly brought an air of romance back to RIAT participation which hasn't been seen for some years. On the subject of romance and surprise, which the team at DBH captured in spades this year, the unexpected updates in the weeks leading up to the first arrivals were pittance when compared to the surprise arrival listed on Thursday morning's "sheet of lies". There, in black and white, was an Israeli C-130J-30 of 103 "Elephants" Sqn from Nevatim Air Base. Unlike other rumours (such as the Ukrainians), this one had been kept well and truly under wraps. The state of disbelief and excitement that morning was palpable, as it was those who entered the showground and saw the machine from the rarely-seen air arm sat there on the tarmac, just like all the others. Ridiculous security arrangements aside, the return of Israel with their bland but brilliant C-130J-30 was one of the true stars of the static display, and harkened back to the days longed-for by the some of the more experienced owls in this hobby and hoped-for by the younger pups. Whether by accident or by design, RIAT, just for a moment, took us back to the pre-internet and pre-social media age, back to the "see what turns up on the day" feel, and it was glorious. On any other year at any other air-event in the UK, the Israeli C-130 would have been an outright star of the show, but in 2017 that's just not been the case. The return of the much-missed B-1B Lancer and B-52H Stratofortress to the static were well received, to say nothing of the Canadian CC-177 Globemaster and CH-147 Chinook, the U-2S, the Australian E-7A Wedgetail, returning Hellenic F-4E Phantoms, the Japanese KC-767, and of course the Ukrainian Il-76 and Su-27, which all made up for a static display that was both top quality, and heavy on numbers - the latter something long-thought to be unachievable at RIAT these days given the ever-diminishing commitment to airshows from air arms home and abroad. The home team, for once, put on a pretty decent showing given their current form. The RAF's MFTS training fleet consisting of the Embraer Phenom T1, Beechcraft Texan T1, and Grob Prefect T1 were present together for the first time in public. 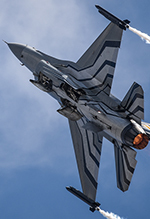 The DHFS Jupiter and Juno were also in the static, the first time the pair had attended a public event together (the Shawbury-based Jupiter breaking days before its intended debut at the RAF Cosford Air Show). The RAF weren't just present with the completely fresh new kit, though, with a pair(!) of A400M Atlases, the sought-after "Op Granby" Tornado GR4 which had just days of service-life left, the special-schemed Tucano and rarely-seen Puma HC2 all bolstering a static display. Where possible, the RAF specials were out in force. Whilst an improvement on previous years, the RAF can still do better, the pair of bland and almost totally un-marked Typhoons marked a bit of a damp commitment to static from the Typhoon force when compared to their commitment in previous years - and how depressing it was that the only way one could tell the squadrons at least one of these machines belonged to was by examining the sharpie-marked air-intake cover. The RAF are improving on their "that'll do" attitude of previous years, but for their 100th birthday bash next year, all the stops must be pulled out. The public like seeing what their tax money pays for, and the more examples of each aircraft type, the more engagement opportunities. Not only is it acceptable to the public for more than a sole-example of a type like the A400M to be on display at an airshow, but it is to be celebrated. The immense size and sight of the pair of RAF Atlases together in the ever-expanding and successful "RAF Village" in the static park will do more to inspire the children in attendance at the airshow than a tired and over-played TV advert ever will. With the noticeably larger static display came other issues, though. In the past two years the western end of the airfield has been put to great use accommodating the fast jet flying display aircraft, enabling the airshow-going public to get up close to the machines. 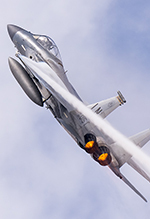 This year, as space was a commodity, the area was used for additional static displays, relegating the display jets back to the north side of the airfield. The jury is out on the whether this is a positive or negative, but if that's the price to be paid for an increased static display, then it's a price I'm happy paying. The more significant problem with an increased static display, though, is that people need more time to view it. Given RIAT's boast of a "eight hour flying display", the most popular times for viewing the statics would be first thing and last thing. Given potential congestion/traffic/security checks in the morning, one would have thought that allowing people to amble around the static park for some time after the flying display concluded would ease road congestion in the evenings, and allow people to see everything they paid to come and see. It's frustrating then, especially after George Bacon's insistence over the speakers that "there's so much still going on" after the flying display has concluded, only to be marshalled out of the showground by volunteers so soon after (there have been reports of this happening half an hour before the advertised closing time). In this way, the Friday half-show day works well, concluding in the mid-afternoon, and giving everyone enough time to see what they want (and paid) to see, albeit with a part of the static display closed off. 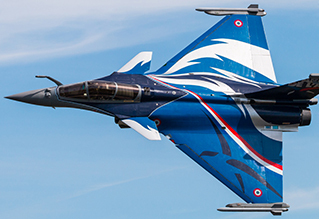 RIAT obviously have a rigid system of timings in place over the weekend, including after the gates close each day, but perhaps thought can be given to extending the length of time the showground is open following the cessation of the flying over the weekend. On the point of commentary, Ben Dunnell continues as the voice of RIAT, a worthy successor to the great (in his time) Sean Maffett. Group Captain Mark Manwaring too plays a successful role, voicing the technical challenges faced by the performing aircrew, calling on his display experience from the days operating the F-4 Phantom on the airshow circuit. George Bacon on the other hand, an experienced and oft-heard commentator at other UK airshows, has been slowly relegated from a semi-leading role in 2013 to little more than semi-regular announcements about goings on around the showground. 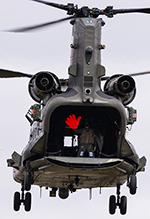 He is fast-becoming redundant at RIAT, and this comes with respect to him, but the absence of his voice next year would seldom be noticed. Away from the static, it was RIAT's flying display that stood out this year and will be remembered. Packed full of items which would all be stars to many different people for many different reasons, including the competent Slovenian PC-9M (winner of the Sir Douglas Bader Trophy for best individual flying display), the Spanish EF-18 Hornet which seemed to spend an extraordinary amount of time hanging in the air, the USAF Raptor Solo Display and Thunderbirds, SoloTurk, the Finnish Midnight Hawks, the belting French Air Force Rafale and the debut of Couteau Delta, to say nothing of the Italian Tornado or C-27J Spartan; all of these items would be stars in their own right at smaller shows (as was the Italian Tornado at the RAF Cosford Air Show, for instance). However, for the past several years and despite the variety we've seen visit the Air Tattoo, some have said, rightly or wrongly, that the flying display achieved a "nearly but not quite" status with the lack of a true "star" item. 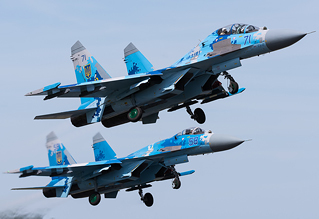 Perhaps we are spoilt, perhaps we're entitled, but regardless of what we are when news of a press-release from Ukraine reported that its Air Force's Su-27 Flanker would be performing a flying display at RIAT, we all dared to believe. RIAT, infamous for (correctly) keeping quiet until every "t" and "i" is crossed and dotted cultivated the suspense by not denying the rumours, and, sure enough, in the week preceding the show, confirmation was finally received and published that 2017 was to be the first time a Ukrainian Su-27 Flanker would display at RIAT this side of the millennium. The display, really, honestly, wasn't outstanding; but it didn't need to be - the brutish beast of a machine did enough and more with its presence alone (helped by the long afterburners and the striking three-tone "digital" camouflage standing out in the gloom). If there was one aircraft that stole the show away from the Americans' birthday celebrations, then this was it. Whether the Ukrainians wait another 18 years to display a Su-27 at RIAT or not, its presence at the show this year will go down as one of the best participants at a RIAT this decade, maybe even further. An award-winning display it was, picking up the "As The Crow Flies" award, as voted for by FRIAT members. However, not all awards were justified. The "Steedman Display Sword" for best UK flying display participant was awarded to the RAF Typhoon. This has been widely thought of as a bad move. How the Battle of Britain's photographically difficult but outstandingly evocative "Thompson" formation of three Spitfires and a Hurricane, accompanied by the first post-restoration public display by the Lancaster didn't earn this accolade instead of a, quite frankly, very standard RAF Typhoon display continues to leave many scratching their heads. The flying display wasn't all roses, either. 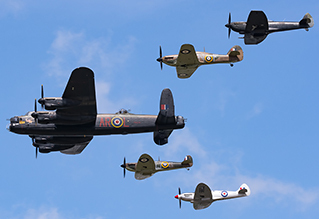 True to form, RIAT's arch-rival reared its head again this year - the great British weather put paid to some eagerly anticipated flying displays on Saturday. Credit to the Italian Tornado, Czech Gripen, and the Finnish Midnight Hawks who tried their best in truly ghastly conditions. 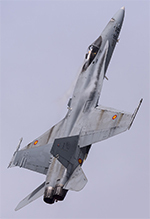 The Spanish Hornet, and RAF Typhoon were both relegated to taxiing down the runway, beaten by the worsening low cloud. However, a truly special mention must go to the Royal Jordanian Falcons. Long-time faithful supporters of RIAT, oft overlooked and oft (unfairly) put down, they braved some of the worst weather that day in their spindly Extras with some formation flying and restored what was, until then, a decidedly glum mood. The drone of their machines notwithstanding, I'd never noticed before how well-spoken and professional their commentator was, talking without any uncomfortable pause and completely off-the-cuff. Similar to the RAF King Air's "Mr. Blue Sky" moment of a couple of years ago, sometimes it's the little things that leave the largest impression. "We had to do something", the commentator said; let it never be claimed that the Royal Jordanian Falcons don't embody the spirit of RIAT heart and soul. Far more disappointingly, however, was the F-22 Raptor's inability to display due to the weather on the Saturday. Perhaps a simplistic comparison to draw, but at a time when the RAF Red Arrows, the BBMF, Sally B, Hangar 11's P-51 Mustang, the monstrous A400M, and the Austrian SAAB J105OE had all performed, and the F-22 could not, the disappointment was felt heavily. 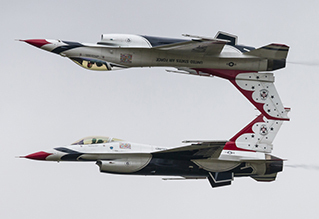 Especially so, given that the cancellation was followed immediately by a formation display by the USAF Thunderbirds. Obviously the pilot has the call on whether to display, and there's zero shame in throwing in the towel if they aren't happy with conditions; but at the very least a taxi down the length of runway, like the Spanish EF-18 or the RAF Typhoon both did, to give the day-trippers a glimpse at the machine which would have been a highlight for them would not have gone amiss. The Thunderbirds themselves flew a very competent and scripted display. Whatever your views on the team, six, let alone four F-16s in formation is seldom seen, and had huge presence at Fairford. Twee, and at times toe-curling, commentary aside, the team don't deserve half of the flak that they get. It was excellent to see their return to RIAT after a ten-year hiatus, and their first time in the UK for six years. Their display marked the centrepiece of a well-supported birthday celebration by the USAF: in addition to the F-22 display and heritage flight with US-based P-51D Frenesi (replacing, for better or worse, P-51B Berlin Express which was down to be the Heritage Flight warbird until its unfortunate canopy incident the weekend before), spectators were treated to a display by an RAF Mildenhall CV-22B Osprey on Friday and Saturday, and rarely-seen USAFE flypasts including a KC-135R from RAF Mildenhall, a C-130J from Ramstein AFB, a pair of F-16s from Spangdhalem AFB and a trio of RAF Lakenheath-based F-15s. The fast-jets in particular offering three passes in various formations were a good addition to the flying display. In the absence of the old USAF "demo teams" bar the F-22, the US commitment to the flying and to the static at RIAT was overall very commendable. Going further, the Thunderbirds' formation with the RAF Red Arrows on the Friday was a nice touch. The final "surprise" though, was the attendance of a B-2A Spirit for a pair of, much to everyone's delight and disbelief, topside flypasts. 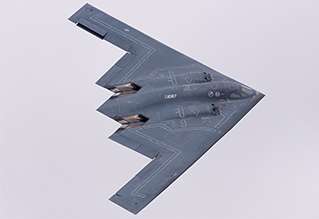 The B-2A was lauded enough when it was confirmed on static display five years ago, but to see the machine in the flying display was something else entirely, and added to the plethora of highlights at this year's show. Not enough praise can go to both the USAF and those at DBH for making that flypast happen, an airshow moment that will be remembered in years to come. The B-2A's attendance on Sunday did cause a problem for those attending only on the Saturday though, as two star set pieces (the Thunderbirds/RAFAT formation on the Friday and the B-2A on the Sunday) must have left a bitter taste in the mouth, especially after Saturday's weather. There were rumours of a U-2 pilot present on Saturday at the show cleared to showcase the aircraft as part of the flying display, and an airframe available, but that this was precluded by paperwork. As things stand, those who paid the same price for a Saturday ticket as they could have done for a Sunday ticket were less a pretty significant flying display item. As someone on the forum commented - tickets "weren't any cheaper if you chose Saturday over Sunday, just worth less". There were rumours that there was a U-2 pilot qualified to perform at the show, and an aircraft available over the weekend. Was this the case? TG: No. Whilst there were aircraft on the ground at Fairford over RIAT with one on static display there was no demo authorised for RIAT. If so, was it the plan to have the Reds/Thunderbirds formation on the Friday, the U-2 on the Saturday, and the B-2 on the Sunday? TG: Again no. 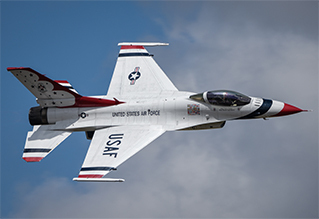 The RAFAT/Thunderbirds formation on the Friday was the only option available given a number of other operational factors. Was there any particular reason the B-2 could not have attended on all three (or at least two) days? Rightly or wrongly, some who attended on Saturday are saddened that the B-2 did not fly on that day, do you have any response to them? TG: I can understand that view and it's unfortunate that those attending RIAT on Friday and Saturday were unable to see the B-2 in the air. As previously indicated, the USAF were only able to support B-2 participation at RIAT 2017 on one day only and a number of operational factors drove that appearance to take place on Sunday. We are incredibly grateful to the USAF for their strong support of RIAT 2017 in their 70th anniversary year. Perhaps the discussion is moot because the B-2 was unadvertised, but it's not-so moot when considering the differences in weather. RIAT should put some serious consideration into the feasibility of a return of the "either day" ticket option, allowing dedicated airshow-goers the flexibility of choice over the weekend. Whilst it's clear that DBH have made great efforts to rectify key concerns over recent years, there were other pricing issues too. The souvenir programme remains at an eye-watering cost in addition to all of the other expenditures throughout the weekend. £12 for a programme that is chock-full of advertisements is too much. A comparable 100-page commemorative magazine from Key Publishing would likely be half the price, with more content. Likewise most other airshows publish their souvenir programmes for about £5/£6. That said, the programme did have some interesting features contained within, including a tribute to the late, great, Wilf Hardy whose artwork has adorned programmes and posters of RIAT past. Credit to RIAT for including the kind words and the nostalgia; no Air Tattoo poster or official artwork has come close to following his. The other sticking-point was the price of food this year. 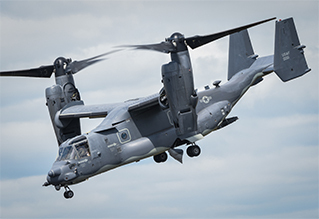 Whether the price itself had increased, or whether it was simply more apparent, sustenance at RIAT made the wallet considerably lighter this year. Whilst it's understood that RIAT set the prices, the cost for some distinctly average food from vendors on the showground was bordering on the extortionate. 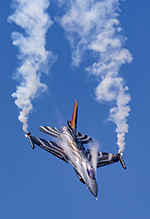 Taking the show as a whole, pleasingly a record crowd of 160,000 visited the airshow across the three days. 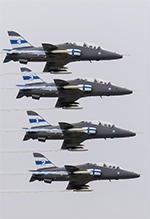 32 air arms from 27 nations were present, with an official total of 246 aircraft taking part. Disputed figures or not, overall those are good numbers for any modern-day RIAT. The hardest reviews to write are those where the organisers have pulled a blinder, and make no mistake; this one has been particularly difficult. Whilst the show was not without flaw, and bludgeoned by particularly poor weather on the Saturday, 2017 saw a truly vintage Air Tattoo, the best for at least half a decade, and probably even further. All eyes will be on RAF Fairford in 2018 for the official "RAF100" centenary celebrations. DBH have shown they're capable. If the Royal Air Force are prepared to step up to the mark and deliver remains to be seen. Let's hope RIAT and everyone involved aren't struck with the curse of a bad show following a good one.